A house built on an imaginary foundation may be a “dream home” but it can never be lived in. The same holds true in politics. One need not mythologize Canadian foreign policy history to oppose the Trudeau government’s egregious position on nuclear arms. In fact, “benevolent Canada” dogma weakens the critical consciousness needed to reject the policies of our foreign policy establishment. Nonsense. If one were to rank the world’s 200 countries in order of their contribution to the nuclear arms race Canada would fall just behind the nine nuclear armed states. Canadian territory has also been used to test U.S. nuclear weapons. Beginning in 1952 Ottawa agreed to let the U.S. Strategic Air Command use Canadian air space for training flights of nuclear-armed aircraft. At the same time, reports Ron Finch in Exporting Danger: A History of the Canadian Nuclear Energy Export Programme, the U.S. Atomic Energy Commission conducted military tests in Canada to circumvent oversight by American “watchdog committees.” As part of the agreement Ottawa committed to prevent any investigation into the military aspects of nuclear research in Canada. Canadian Forces also carried nukes on foreign-stationed aircraft. At the height of Canadian nuclear deployments in the late 1960s the government had between 250 and 450 atomic bombs at its disposal in Europe. Based in Germany, the CF-104 Starfighter, for instance, operated without a gun and carried nothing but a thermal nuclear weapon. During the past 70 years Canada has often been the world’s largest producer of uranium. According to Finch, by 1959 Canada had sold $1.5 billion worth of uranium to the U.S. bomb program (uranium was then Canada’s fourth biggest export). Ottawa has sold at least 29 nuclear reactors to foreign countries, which have often been financed with aid dollars. In the 1950s, for instance, Atomic Energy Canada Limited received large sums of money through the Colombo Aid Plan to help India set up a nuclear reactor. In his 2006 book “Just Dummies“: Cruise Missile Testing in Canada Clearwater writes, “the record clearly shows that Canada refuses to support any resolution that specifies immediate action on a comprehensive approach to ridding the world of nuclear weapons.” Since then the Harper/Trudeau regimes’ have not changed direction. The Harper government opposed a variety of initiatives to curtail nuclear weapons and, as McQuaig points out, the Trudeau government recently boycotted a UN effort to sign a treaty, supported by two thirds of 192 member states, to rid the world of nuclear weapons and prohibit the creation of new ones. But, it’s not only nuclear policy. The Trudeau government’s arms sales to Saudi Arabia, attacks on Venezuela’s elected government, support for Rwanda’s brutal dictatorship, empowerment of international investors, indifference to mining companies abuses, military deployment on Russia’s border, support for Israel’s illegal occupation etc. reflect this country’s longstanding corporate-military-Western centric foreign policy. While Harper’s foreign policy was disastrous on many fronts, it was a previous Liberal government that instigated violence in Afghanistan and the most flagrant Canadian crime of this century by planning, executing and consolidating the overthrow of democracy in Haiti. 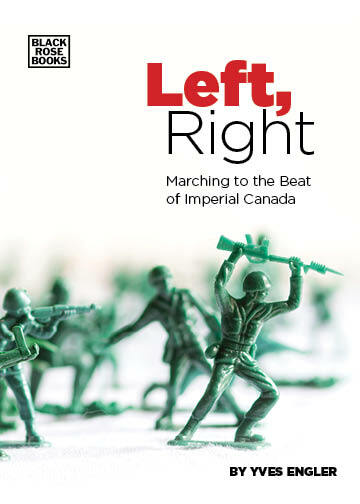 Leftists need to stop seeking to ingratiate themselves with the liberal end of the foreign policy establishment by exaggerating rare historical moments when Ottawa apparently did right. Power relations — not morality — determine international policy and the benevolent Canada myth obscures the corporate and geostrategic interests that overwhelmingly drive policy. Progressive writers should focus on developing the critical consciousness needed to rein in the foreign policy establishment. Only the truth will set us free to make this country a force for good in the world.